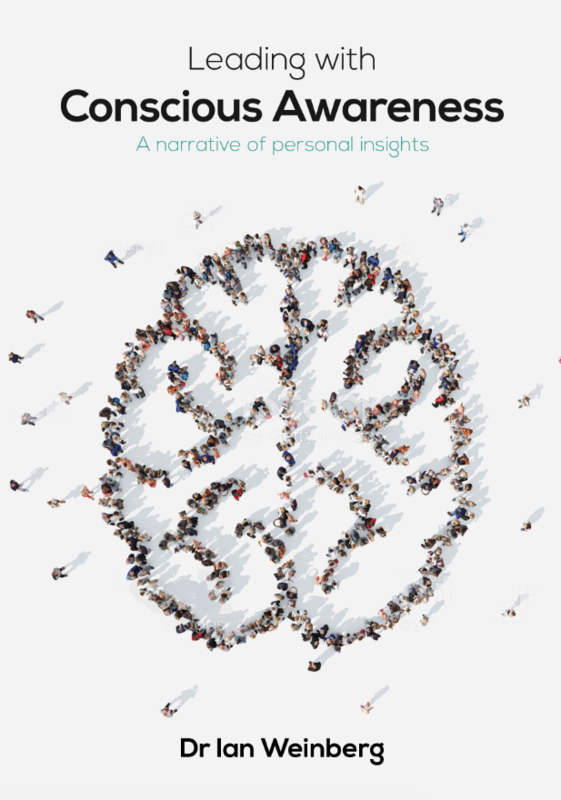 "Leading with Conscious Awareness: a narrative of personal insights is more than a book. Rather it's a comprehensive guide that has the power to change lives. Through his experiential thought provoking foray into one's psycho-physiological and elemental imbalances, Dr Ian Weinberg's adept ability makes the intimate link between mind, body, spirit and the brain and its impact on our psyche, physicality and well-being. His personal insights and 25 year methodology provides a deep understanding that it is possible to live a life free of suffering, anxiety, depression and neurosis. In the identification of one's unique archetype, it gives us pause to think and reflect and therein dawns a realization that transformation and radical change in behaviour lies in understanding the machinations of the brain. Leading with Conscious Awareness requires it to be put down periodically and re-visited again and again, to reflect on the words, apply it to your own life experience and find solutions to embark on a journey of healing, balance and renewal that would unleash your innate highest potential." Ian Weinberg is a practising neurosurgeon and a pioneer in the application of psychoneuro-immunology, PNI, the scientific study of the influences of mind states on immune function. Passionate about human consciousness and its enhancement, Ian developed a comprehensive coaching programme in 1992 which has evolved to the present time. Based on the integration of the neurosciences with PNI, the program is designed to enhance wellness, performance and leadership in the personal, clinical and corporate environments. A further unique component is the online diagnostic (psychometric) which provides an accurate quantification of the user. Ian continues to practise neurosurgery in his private practice as well as providing personal neuro-coaching (neuromodulation) in the clinical and corporate environments. Additionally, Ian facilitates corporate-based workshops as well as workshops for the training of coaches seeking accreditation in the use of the programme. In order to purchase the book you will need to register as a purchaser/user. To register, click on the link below. You will then be able to create your own password-controlled account. Click on Purchase on your My Account page. You will be taken to the Purchase page. Check E-book: Leading with Conscious Awareness and you will then be taken to a secure purchase page. Once payment has been received, your My Account page will be uploaded with a copy of the book. You will also receive a notification e-mail. Thereafter login to your My Account page and download the e-book. Click here to register and initiate the process.